With our wealth of expertise and strong network, Carbon Care Asia (CCA) can provide a range of value-added services to help companies and organisations enhance their sustainability / ESG performance, enrich relevant reports, as well as achieve the objectives of capacity building and CSR initiatives. 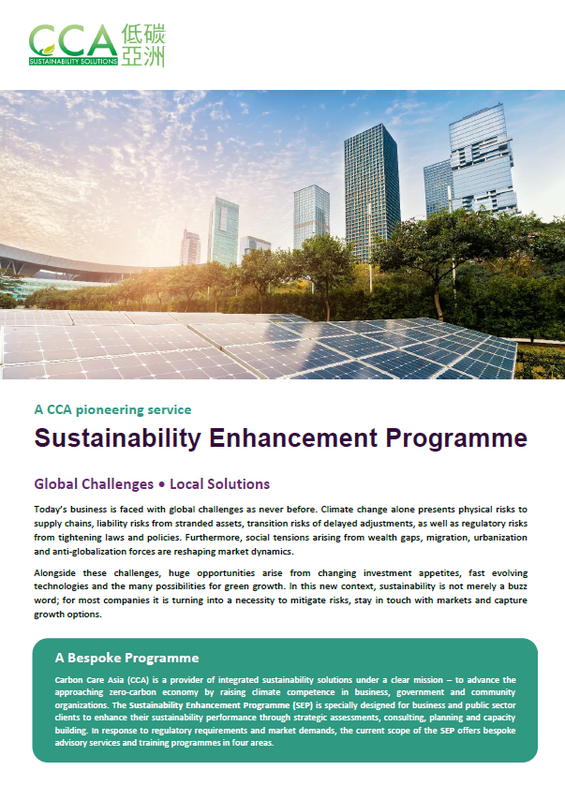 CCA is a provider of integrated sustainability solutions under a clear mission – to advance the approaching zero-carbon economy by raising climate competence in business, government and community organizations. The SEP is specially designed for business and public sector clients to enhance their sustainability performance through strategic assessments, consulting, planning and capacity building. In response to regulatory requirements and market demands, the current scope of the SEP offers bespoke advisory services and training programmes covering four areas: “Climate Competence”, “Change Management”, “ESG Performance” and “Sustainability Roadmap”. 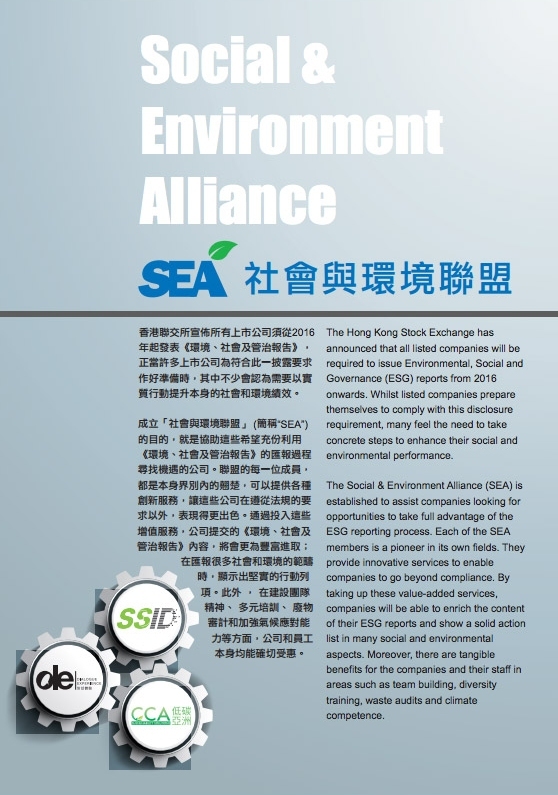 Carbon Care Asia has formed the Social & Environment Alliance (SEA) with Dialogue Experience and SSID to assist companies looking for opportunities to take full advantage of the ESG reporting process. Each member of the SEA is a pioneer in its own fields, which provides innovative services to enable the reporting companies to go above and beyond compliance. By taking up the various value-added services from the Alliance, companies will be able to enrich the content of their ESG reports and show a solid action list in many social and environmental aspects. Tangible benefits for our clients and their staff include team building, diversity training, waste audits and climate competence.